Seen Through a Glass: Session Beer Day, April 7! I don't often double-post from one of my other blogs, but this is one of those times; since the Session Beer Project actually started here, it seems proper. I suggested to the members of the small (but rapidly growing) Session Beer Project page on Facebook that we should make April 5th (4.5) or April 7th (Little Repeal Day, when 4.0% ABV beer became legal before repeal of the 18th Amendment) our day, Session Beer Day. We could ask for session beers at our favorite bars, and brewpubs, and suchlike, invite people to try them, gin up plenty of social media whoopee, and all dat. We decided on April 7: there are a lot of photographs of a LOT of Americans happily drinking 4.0% beer we can use, it's a day the beer industry is already aware of, and...it's a Saturday this year (the day before Easter, which is actually kind of weird for me; I have a tradition of drinking big beers that afternoon), which doesn't hurt when you're planning a beer event! What to do? If you work at a bar (or manage one, or own one), please consider throwing some under-4.5% beers on for April 7th, and making a special price or promotion for them. Tell folks it's Session Beer Day, and encourage them to see how good lower alcohol beers can be. (Good day to get a "We Support" window sticker, too!) If you're a brewer or wholesaler, encourage your accounts to pick up your under-4.5% beers for that day; it's a great chance to promote those beers! 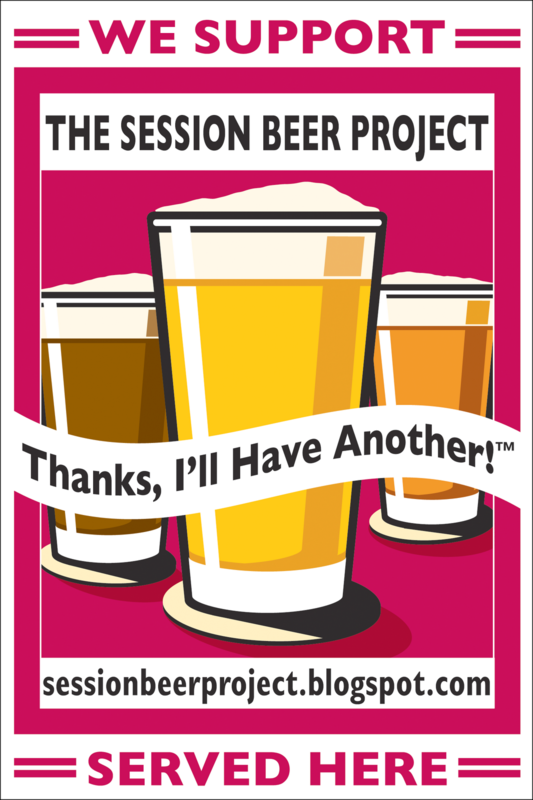 If you're a beer blogger/tweeter/writer, please consider spreading the word about Session Beer Day: use the hashtag #sessionday . 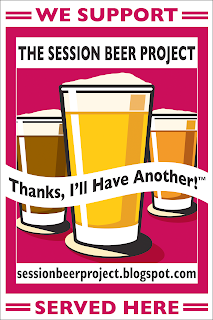 And if you're a session beer drinker...get out there and ask for it! We've got some interest...but this is totally grassroots. This isn't a sponsored event, it's not organized (if you know me, you know that), and it's simply about going out and drinking session beer -- 4.5% or lower, good-tasting, great beer -- and enjoying it. "Gin up" session beer: I'm for that! Lew, I'm working to get some sessions going in Chicago. Posted a link today at Cheese and Cheers, and hope to post a Chicago preview on Thursday next week. Good on you for the Session Brew promotion. For many, in years past, higher alcohol content was a prime rational for buying higher cost craft beers... It is now long past time to highlight the benefits of brews which meet the real definition of session beer. That definition applies to homebrewed as well as commercial quaffs.